India’s billionaire population is expected to grow 37 per cent in the next five years, beating the global and Asian averages, said a new report by UK-based property consultant Knight Frank on Wednesday. In Asia, the number of billionaires is expected to grow 27 per cent, while the number in North America is set to rise 17 per cent and in Europe by 18 per cent, between 2018 and 2023. The number in Asia is expected to touch 1,003 in the next four years — more than a third of the world’s total billionaire population of 2,696, said The Wealth Report by Knight Frank. 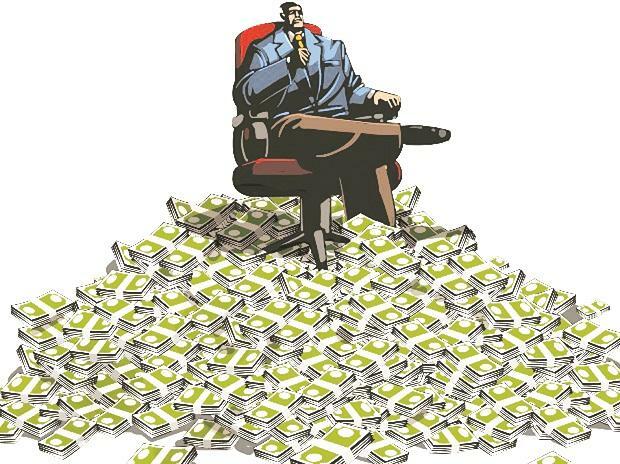 India saw a rise of 116 per cent in billionaires from 2013-18, the report added. In terms of growth in the number of ultra-high networth individuals (UHNWIs) — those with net assets of $30 million or more — the country is expected to see a growth of 39 per cent, the highest globally. India is followed by The Philippines (38 per cent) and China (35 per cent), it said. “Despite the election uncertainties of 2019, India’s wealth is expected to surge over the next five years, with the numbers of UHNWIs rising to 2,697,” it said. The report also said India’s UHNWIs will grow fastest globally over the next five years. Bengaluru is expected to lead the UHNWIs growth story. According to the report, the city will see a growth of 40 per cent in UHNWI population, making it the first among the top five future cities in the world. The report said that on an average, Indian UHNWIs own 3.64 homes and have allocated nearly a quarter of their wealth to property. According to the Attitudes Survey in Knight Frank’s Wealth Report, 25 per cent of Asian UHNWIs plan to buy a home outside their country of residence by 2020, higher than the global average of 22 per cent. About 18 per cent of Indian UHNWIs showed an affinity towards purchasing homes outside their domicile country. The survey is based on responses from 600 wealth managers and private bankers across the world. 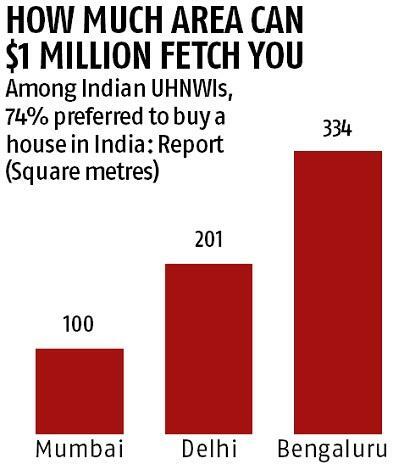 Among Indian UHNWIs, 74 per cent preferred to buy a house in India, while 39 per cent responded favourably to the US. “Both these places are of high interest for the India ultra-rich, from business as well as leisure and lifestyle perspectives. These also remain the top choices for investment or for self-use purchase, in the coming years,” it said. 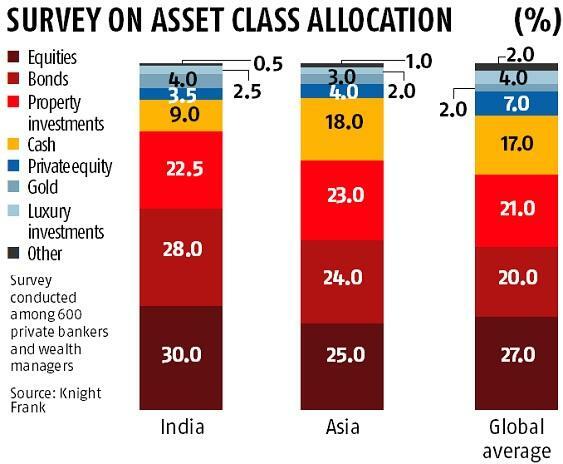 Wealth managers said their Indian clients allocated 30 per cent of wealth in equities (against the global average of 27 per cent), 28 per cent in bonds (against the global average of 20 per cent), and 9 per cent in cash.